Broccoli, add a pinch of salt and a few drops of oil to a pot of boiling water and blanch the broccoli for less than 1minute. 1. Soak dried shiitake mushrooms in water for several hours or until soft, wash thoroughly till water running clear. 2. Heat sesame oil in a wok over medium flame, add in ginger and stir fry till fragrant. 3. Add in water and allow to boil. 4. Add in mushrooms and season with oyster sauce and light soy sauce. 5. Cover and simmer over low flame for about an hour or until gravy is thicken. 6. Last seasoning with salt and sugar, then add in rice wine, and adjust the taste accordingly. 7. Remove mushrooms and arrange on a serving plate, pour gravy over the mushrooms. 8. 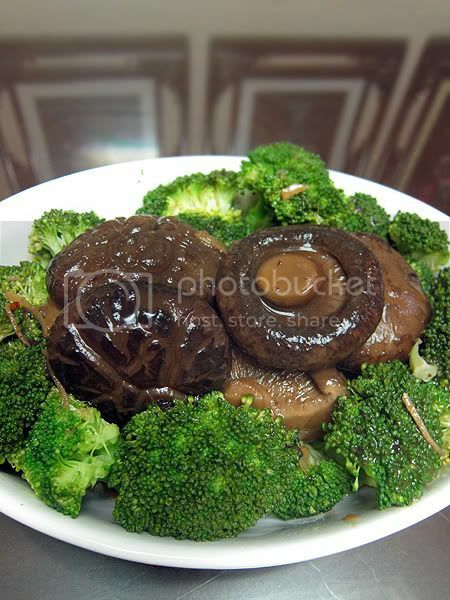 Garnish with cooked broccoli. **you may replaced broccoli with other type of vegetables . Did anyone ask you to do this for CNY after eating this??? I really love shiitake and this recipe sounds so delicious! Nice shot and lovely dish ! this remind me I need to cook some for my son Lucas as he love mushroom a lot. 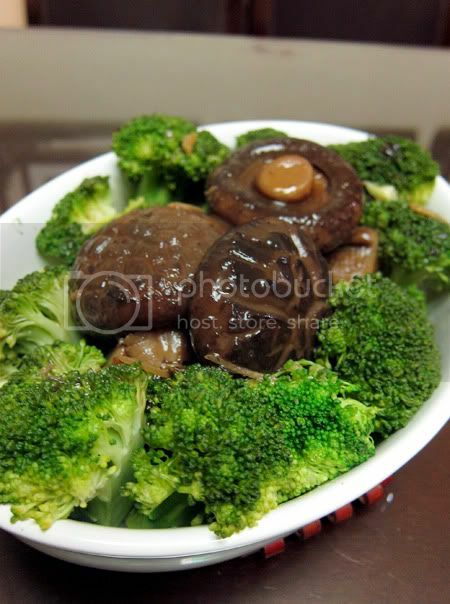 I love braised mushrooms too, so healthy and delicious! This really looks like the version served in Chinese restaurant!